John graduated in 1991, from Macquarie University School of Chiropractic and worked in Sydney before establishing Terrigal Chiropractic and Natural Therapies Centre with Nicola in 1994. 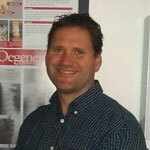 He has a special interest in Chiropractic Paediatrics, having done 3 years postgraduate study in Chiropractic Paediatrics. John is particularly interested in children suffering from learning and behaviour difficulties, children experiencing recurrent ear infections or bed wetting, however his experience is across a multitude of childhood conditions. He is married to Nicola and has three children, Malachi, Zali and Emerson. He is a past member of the Advisory Board to Sydney College of Chiropractic, was a tutor at Macquarie University School of Chiropractic for 10 years and is a Governor of Sydney College of Chiropractic.